Does your kiddo love Minecraft? Maybe they'd like to be one of the all-time greatest Minecrafters this Halloween! Sure, lots of kids dress up in Minecraft costumes at Halloween, but now, with this Tube Heroes costume, your child can become one of their favorite Minecraft players, in blocky Minecraft form, of course! DanTDM is a YouTube personality and a revered gamer, particularly when it comes to the blocky world of Minecraft. This costume is based on the super popular Tube Heroes Toy Company, who produced an epic DanTDM action figure. This costume recreates the toy's appearance into a fun Halloween style! 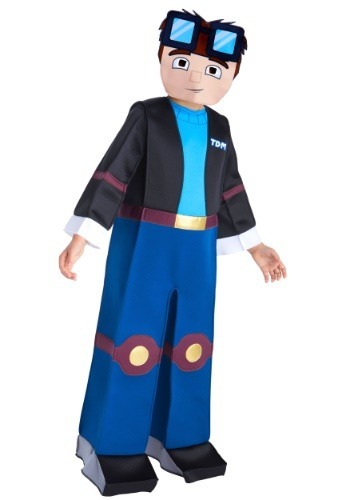 This Tube Heroes Dan TDM Boys Costume is officially licensed. It comes with a jumpsuit and character mask, and is made with polyurethane foam to create the "blocky" appearance. The one piece jumpsuit features printed costume details like kneepads, a blue shirt, and a TDM logo on a jacket. The mask is printed with facial details on the flat front, along with goggles depicted on the character's forehead! Kids love Minecraft and kids love YouTube. So, what we're saying here is that this costume is sure to be a big hit this Halloween! Shop our entire selection of character costumes to find all of the latest video game trends if you've got to get costumes for a little crowd. We're sure when your trick-or-treat party gets together, they're going to be instantly famous!